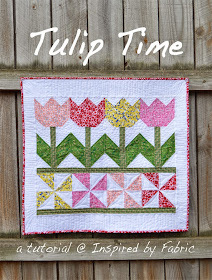 We're here today with a spring-inspired tutorial--the Tulip Time wall hanging, made using our Graphix 3 collection. Check out the tutorial and then make sure you leave a comment for a chance to win a bundle of Graphix 3 fabrics. This giveaway is now closed, but you can still enjoy the tutorial! (We've since made this quilt in our Painter's Palette Solids as well. 1. Draw a diagonal line on the wrong side of each white square. 2. 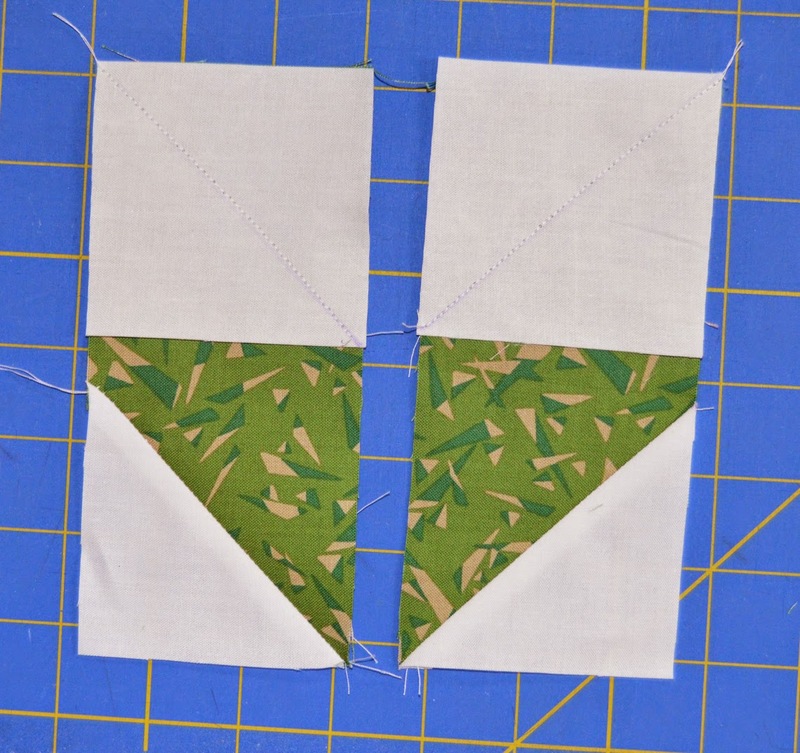 Pair each 2-3/4" marked square with a 2-3/4" bright square, right sides together. 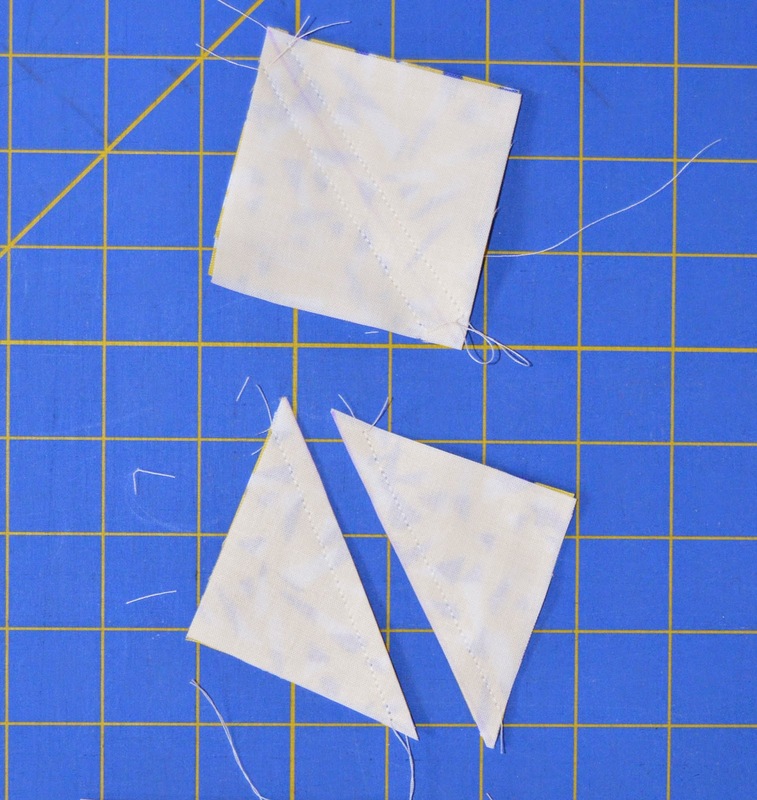 Stitch 1/4" on either side of the marked line, cut on the line, and press both half-square triangles (HSTs) open. 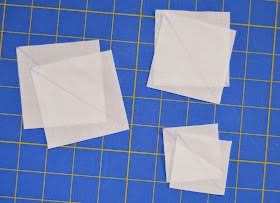 Trim HSTs to measure 2" square. 3. Layer 2" marked white squares on the two bottom corners of a bright 4" x 6-1/2" piece as shown. Stitch on the drawn line, trim 1/4" past the line, and press open to make a tulip bottom. 4. 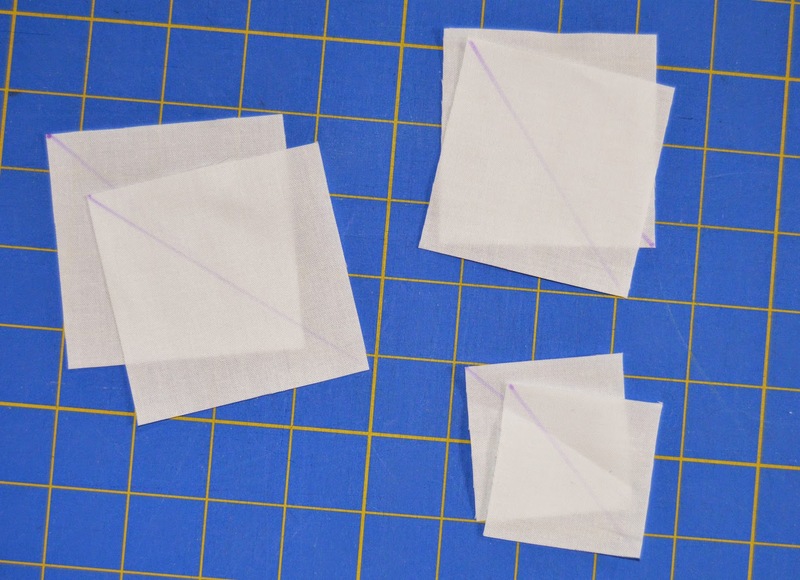 Lay out the four HSTs as shown to make three tulip points. 5. Sew the HSTs together and sew to the tulip bottom. 6. Lay a 3" marked white square on the bottom half of a 3" x 6-1/2" green triangle piece, noting orientation of the line. Repeat, making sure to position the marked line opposite the line on the first piece (mirror image). Stitch on each drawn line. 7. Trim 1/4" past the seam and press open. 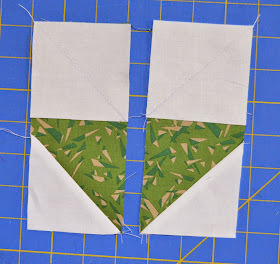 Layer a second marked square on the top of each green piece, noting orientation. 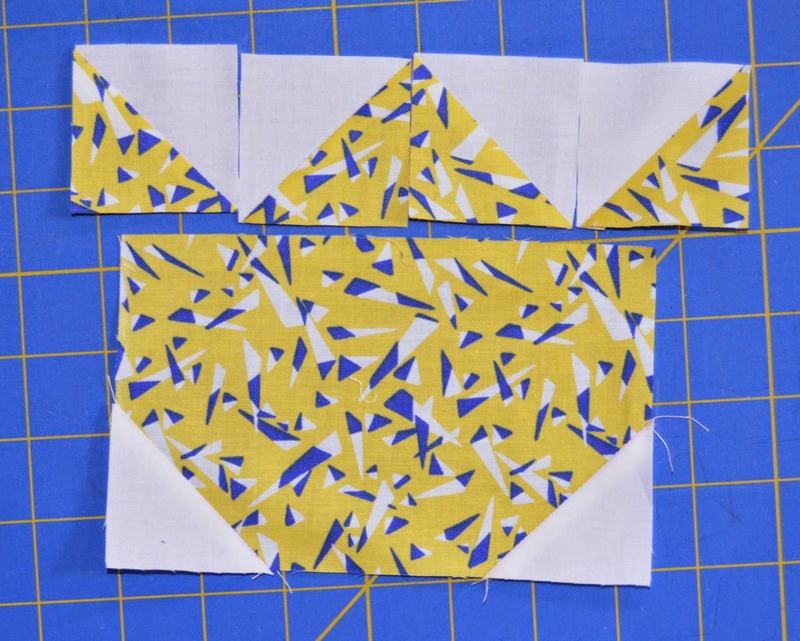 Stitch, cut and press open to make two mirror image leaf units. 8. 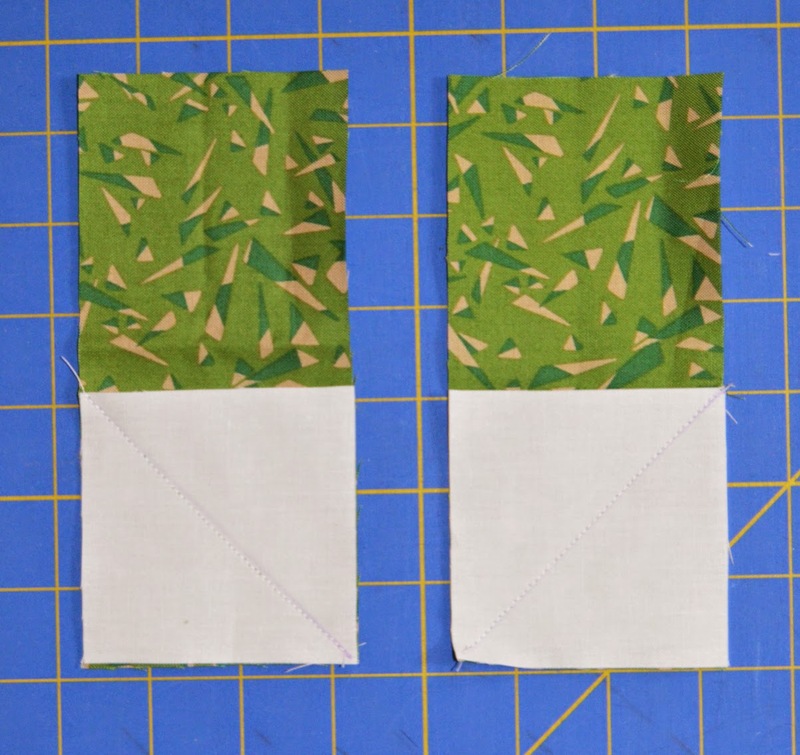 Sew a 1-1/2" x 3" white piece to the top of each leaf unit as shown. 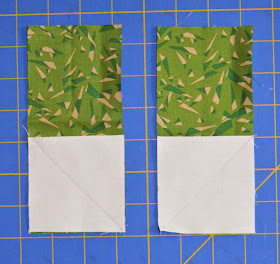 Sew a 1-1/2" x 7-1/2" green zigzag stem between the two leaf units to make a leaf/stem unit. 9. Sew the leaf/stem unit to the bottom of a tulip. Repeat to make three additional tulips and leaf/stem units. 10. 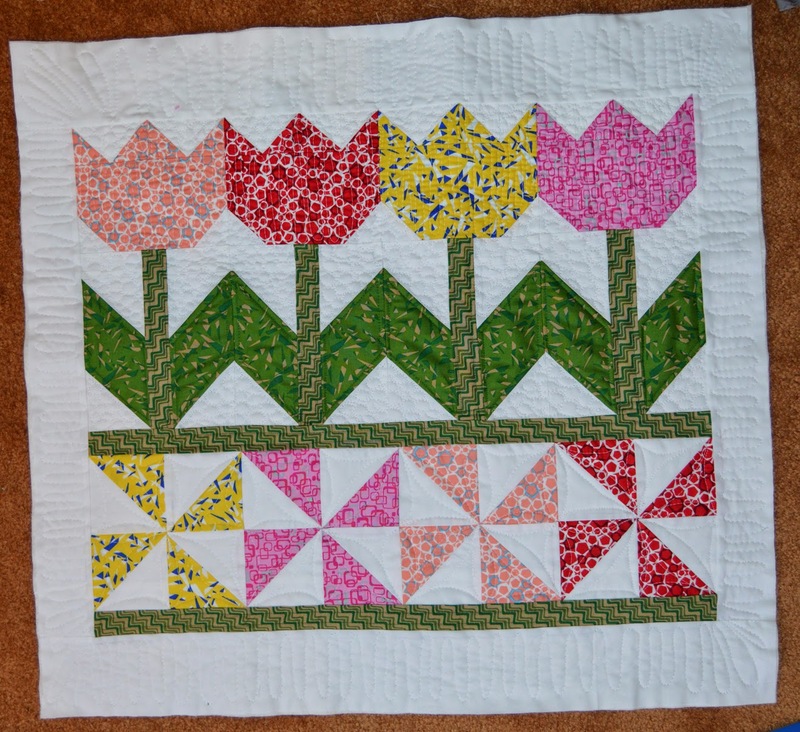 Lay out the four tulip blocks in a row and sew together. 11. 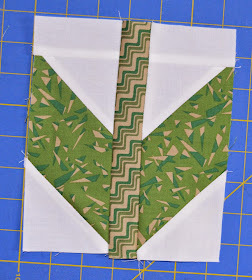 Layer a 4" marked white square on top of a 4" bright print square and make HSTs like in step 2. Trim to measure 3-1/2" square. 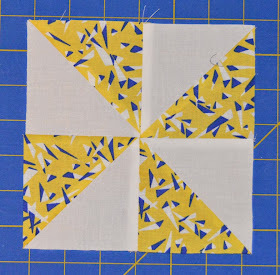 Make four HSTs in each color combination and join the HSTs into a pinwheel block as shown. Make one pinwheel block in each color. 12. 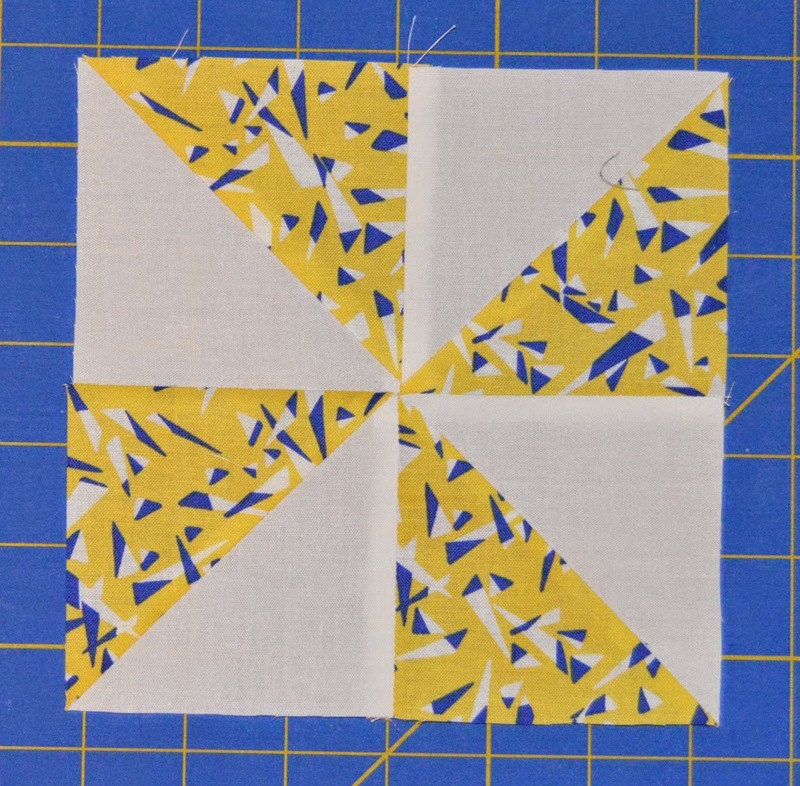 Sew four pinwheel blocks into a row. Trim the two 1-1/2" x 42" green zigzag strips to measure 24-1/2". 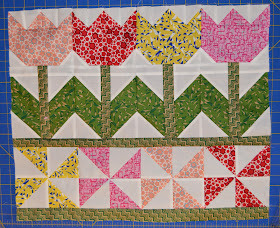 Sew them together with the tulip row and pinwheel row as shown. 13. Sew 2-1/2" x 20-1/2" white strips to the sides of the quilt top. Sew 3-1/2" x 28-1/2" white strips to the top and bottom of the quilt top. Machine quilt the wall hanging. 14. 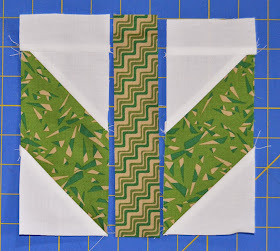 Use the three 2-1/4" x 42" strips to bind the wallhanging. 15. Hang on your door or wall and enjoy! We hope you enjoyed this tutorial! It's a great way to have tulips around your home even if Mother Nature isn't cooperating! For a chance to win a bundle of Graphix 3 for yourself, leave a comment letting us know that you follow our blog (you can sign up to follow by email or by blog reader in the right hand sidebar), as well as which is your favorite print from the collection. The giveaway will be open through Saturday, April 4 at 11:59 pm EST. This giveaway is now closed. I just love this little wall hanging, so bright and springy. Makes me want to sew today!! I follow your blog on Feedly. I like the 120-2125 Black/Dark print. What a cute wall hanging. I may make one up today and give to my niece when she comes up from Texas this weekend. I follow you via bloglovin. Gorgeous wall hanging, I might just start making one right now from my own stash! Otherwise my favorite print from the collection is 120-2124 (yellow). It's amazing how the "feel" of these prints changes when they are put into a feminine, floral wallhanging. Seen on their own, they have a much more masculine energy--and both are great, I think. My favorite print is # 120-2121, which reminds me of the funny faux tile floors I used to see so often whenI was a kid. I was always looking for the "pictures" hidden in the patterns, which kept me busy and sparked my imagination--the indoor version of finding faces in clouds. I follow on Bloglovin! Thanks for the chance to win! So springy....love it! I follow you on bloglovin! Oops, forgot to say I like the blue/yellow! I follow by email. My favorite is the 120-2130 peach print. My favorite print is 120-2111. I follow you with Bloglovin. Thanks for the giveaway! I love Tulips...These were the 1st flowers I received from my husband on our very 1st Valentine's Day...We had been dating only for a couple of weeks and he said he did not want to be like other guys and bring the same flowers to me on our date...So wonderful a wall hanging that I can make to remember him by. He passed 13 years ago. HI,love this Mini,especially the tulips! My favorite print is the Red Graphix! Follow>Blog Lovin'! Thanks for sharing! Love this sweet little quilt. I so wish the tulips were blooming here in western PA. I'm just starting to see them break through the ground. My favorite print in the collection is 120-2108. I follow by e-mail. My favorite flower is the tulip in spring! I follow you through Bloglovin. I also get you in emails. 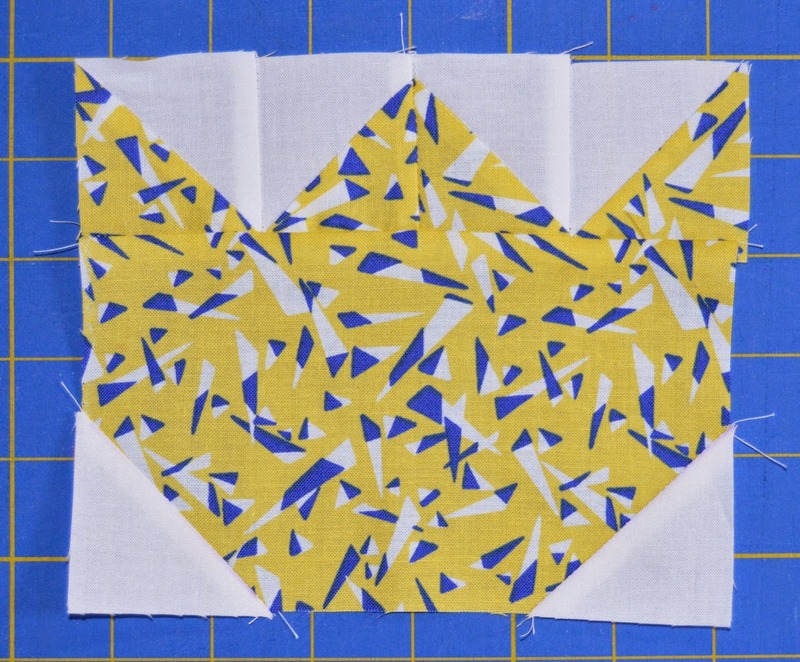 I like the yellow/blue/white fabric best but all of them attract my attention. 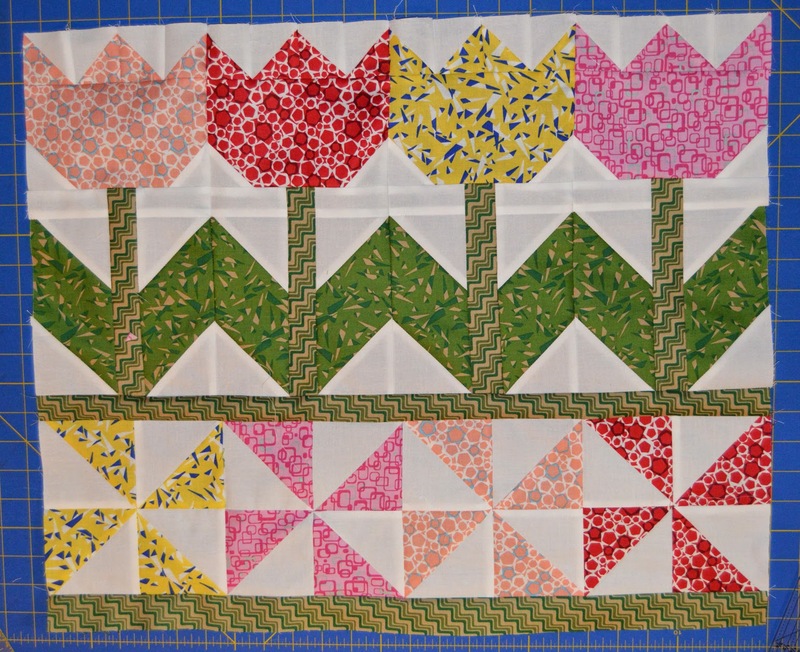 An excellent tutorial for a great spring themed wall quilt. 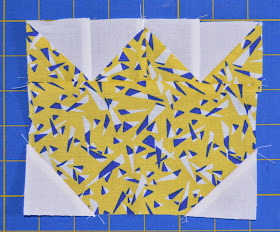 I really like the blue triangles Graphix 3 print 120-2128. I follow by email and bloglovin. I like the pink 120-2106. Thanks for the tutorial for the tulip wall hanging. I follow the blog with GFC and email. Nice Wallhanging could do with a bit of spring here ,where it has been snowing all afternoon ,and the wind is picking -up too help it blow around.All of the fabric colors are beautiful its hard to pick just one I picked 120-2121.Thank you for a chance to win. I follow you on facebook and email. Cute Spring wall hanging. I like all the "bubble" prints in the collection. I forgot to say that i follow by email. I follow by email. I think this would be just a great table cover for me! I need a new one. OH my gosh; I just love this wall hanging. The second I saw that, I wanted to put everything on both my sewing and cutting tables into a big bin and start sewing one right away. I would love to make this for my MIL as a Mother's Day gift. She loves to garden and as she lives in Holland, MI where they have the yearly Tulip Time Festival it would be just perfect to hang in their home there. She just loves her flower gardens around their property. I am already an email subscriber, Facebook follower, and also follow on Bloglovin'. My favorite print from this fabric collection is 120-2108 the purple/blue squares. Very pretty and they remind me of things my Mom had from the 1950's. She used to have a table lamp with a lamp shade had designs much like this print I like so much. What a lovely springtime project! I like 120-2130 and 120-2133 best from the project. I follow by email. I follow on Bloglovin'. I "sew" have to make this ! I follow by email and on Facebook. Great project, and I was just thinking about doing tulips for a runner. Thanks. 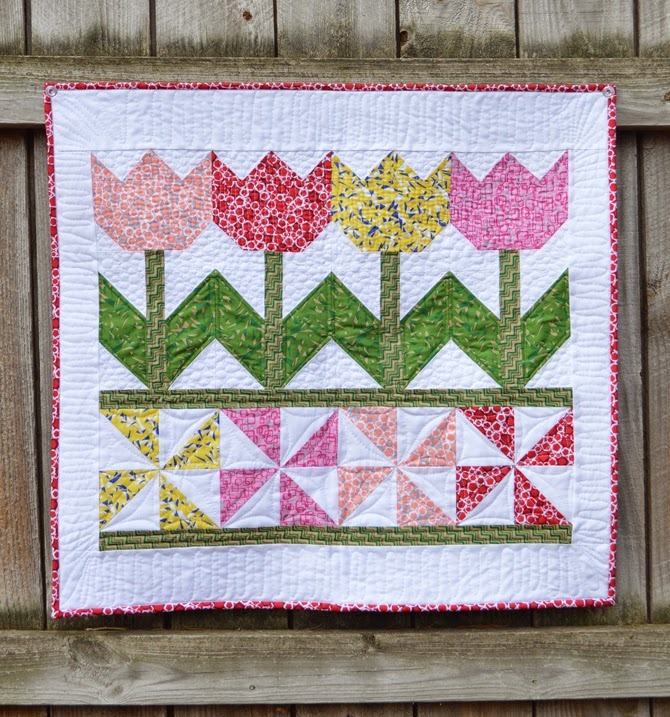 As soon as I saw this lovely tulip quilt, I knew I wanted to make one! Tulips are a definite sign of spring and we are ready for them here in Iowa after such a long, cold winter! I follow you on Bloglovin' and my favorite print is 120-2134: the blue and green/yellow just seem to glow! This is so cute! I really like the yellow fabric. It's a great line. I follow via Bloglovin. 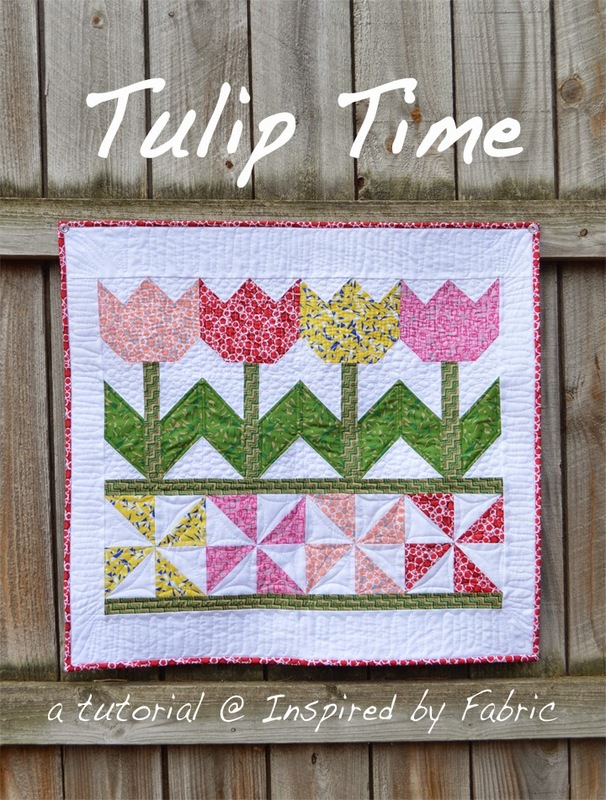 I love this tulip wall hanging and am planning to get some fabrics real soon. The best Graphix I like is 120-2121. Actually I like all of those designs. 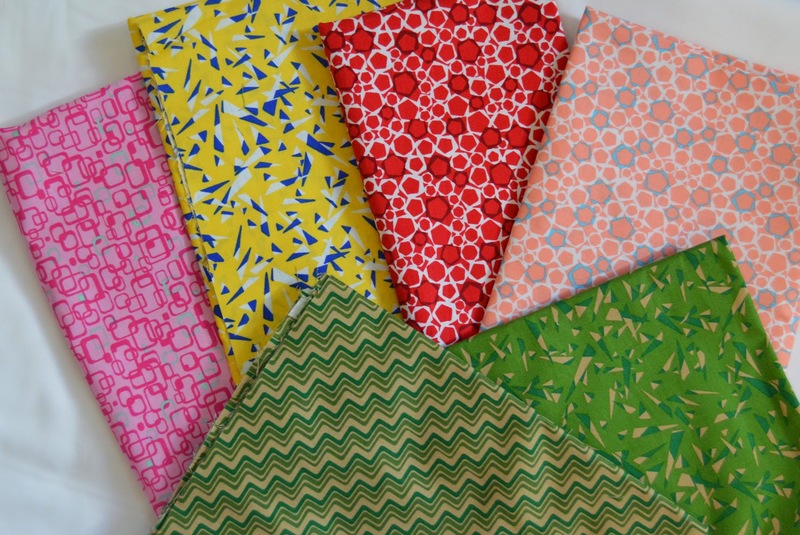 I follow the Inspired Fabrics blog all the time. I'd really love to win these cool Graphix! Thank you for the great tutorial. I love every.single.one of the prints in this collection. I would gravitate to the red prints and the blue prints. I follow via Google Friends Connect. My favourite is 120-2105 as the black and white will work well with my black and white stash. Spring is finally in the air. Love your "tulips". Forgot to mention that I follow via email. bloglovin, FB, and GFC. Love the flowers. There are a lot of designs in this collection. I like the blue/teal combinations. No favorite, I like them all. I follow with email. Thanks. Great tulips! I like the red fabric best, I think. I follow you on with Bloglovin'. What a great Spring wallhanging. So nice of you to share with all of us. My favorite is blue triangles Graphix 3 print 120-2128. I follow by email and bloglovin. I like 120-2102 through 120- 2109 - that print is awesome, love the retro vibe. I follow you via bloglovin. And tulips are my favorite flower! Such a cute quilt. Thanks so much for this tutorial. I just finished the quilt top and am looking around at my fabric to decide what to do for backing material. This is going to be a great Mother's day gift for my mom. Thank you! 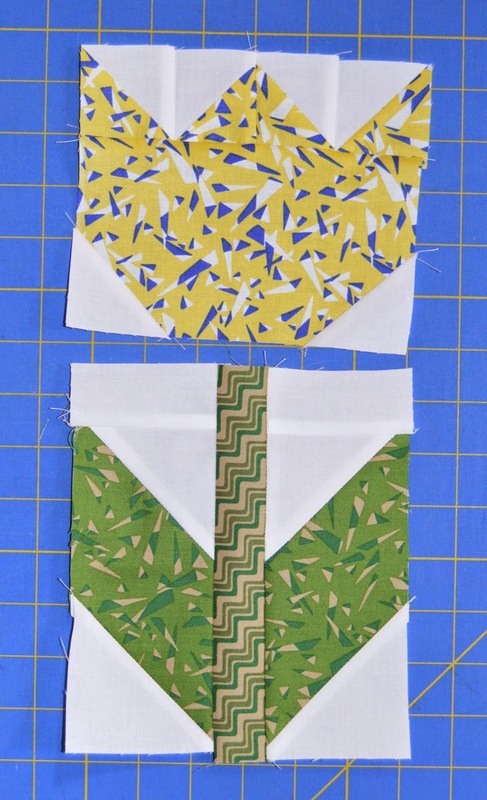 A couple of things I notice as I was putting it together... First, the cutting for the pinwheels isn't included in the colored fabric selection. The other thing is that I was actually using fat quarters for everything but the background material. It would have been nice if the green strips that go across were just listed as 2 - 24" pieces. It is my fault that I didn't completely read through the pattern first, but I wouldn't have pieced two strips together to get a 42 inch strip if I had known I was going to cut it back down to 24 inches anyway. This pattern is such a nice gift to us - thank you! 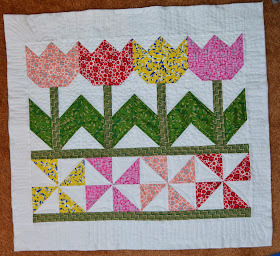 I am so looking forward to spring and this bright mini-quilt just sparks enthusiasm. I like the salmon colored fabric best (the first tuilip). I'm going to downsize this and use it to make a bag for my mother-in-law's walker. It will lift her spirits to think of spring! I follow your blog by email. I love this little tulip wallhanging. I would love to win the fabric bundle. What a great way to start Spring! 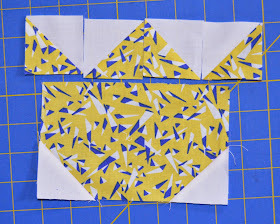 This will be a cheerful wallhanging for my mom in assisted Thanks for your blog! Thank you for posting this! I just used the photo and made up my own measurements so it ended up large enough to hang on my balcony. 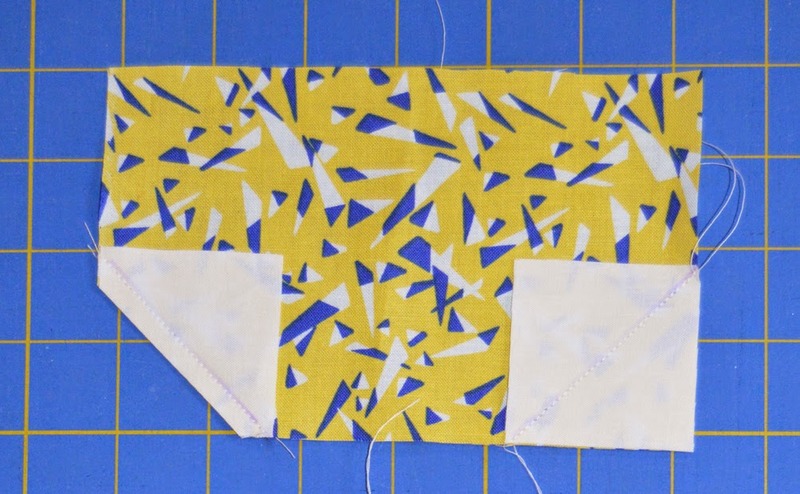 I also pieced together the binding using scraps from the quilt so it's multi-coloured. It's a wonderfully simple but beautiful project. I love this!!!! I'm rearranging my sewing schedule so I can get this done asap! This is the nice wall hanging idea. 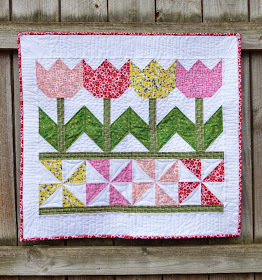 I love this tulip wall hanging. Thanks for this tutorial. Making this now and have a problem with the measurements. The four 2" half square triangle blocks for the top of the tupip do not sew down to 6 1/2" for the main part of the tulip after sewing them together (step 4). How did you fix this? The picture even shows the top row will not fit the block. Me encantó, pero están mal las medidas, tuve que arreglarmelas. ON YOUR MARK is my favorite collection. I just love this little tulip wall hanging. Thank you for the giveaway. nice information. Thanks a lot for such wonderful information.